In 2016, the Kuwaiti Government launched the Kuwait Online Visa, which is an electronic travel authorization. This system was created to simplify and expedite the visa application process, making it easier and faster to apply and consequently obtain a visa to travel to Kuwait. You don't need to send your passport to an embassy or go for an interview. 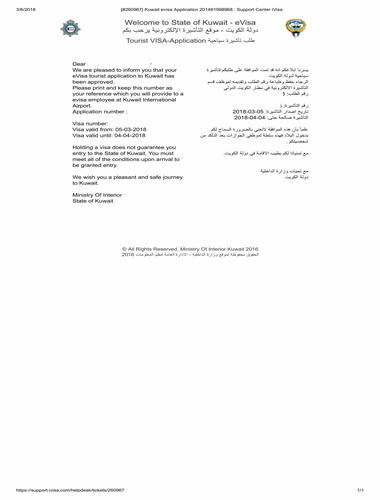 The Kuwait Government issues the visas online and iVisa will send you this document in PDF format by email. Applying through iVisa will allow you access to your own personal online account where you can easily track the status and approval of your visa. The Kuwait online visa is a single-entry visa which allows travelers to enter Kuwait for tourist purposes, for a maximum stay of ninety (30) days starting from the entry date. Visitors cannot use the visa to enter Kuwait more than once. Travelers should keep their visa on their electronic device or the printed copy of their e-Visa at all times during their stay. Travelers who want to visit Kuwait must have a passport valid for at least six months from the planned date of entry. Holders of travel documents (NOT A NATIONAL PASSPORT) should not make e-Visa applications, they should apply to the director of immigration services through the nearest Kuwait mission. In addition to the online fee for the e-Visa you may be required, based on your nationality, to pay a fee of approx $10 USD / 3 KD upon arrival to Kuwait. The applicant's work according to the GCC residency should be one of the following: Consultants, Doctors, Engineers, Lawyers, Judges & Members of Public Prosecution, University Teachers, Press & Media Staff, Pilots, System Analysts & Computer Programmers, Managers, Businessmen, Diplomatic Corps, University Graduates – Owners, Managers and Representatives of Commercial Companies and Establishments. The applicant must not have any security restrictions that prevent them from entering or exiting the country. IMPORTANT: Kuwait Visas are not processed on weekends (Friday and Saturday). What is the Kuwait e-Visa? The e-Visa is an authorization document that allows visitors to travel to Kuwait entry point. What do I need to apply for a Kuwait e-Visa? What is the cost to obtain a Kuwait e-visa? The cost is 20 USD for standard processing. For rush processing and super rush processing, the cost is 60 USD and 80 USD, respectively. How long does it take to process a Kuwait e-Visa? How long is Kuwait e-Visa valid for? The Kuwait e-Visa is valid for 30 days from the date of issue. This means that you have to enter Kuwait within 30 days of the e-Visa issuance. However, you can apply for your Kuwait e-Visa with us at any time, as we will automatically queue your order until it's the right time for processing. What conditions must the applicant’s passport meet for a Kuwait e-Visa? Applicant’s passport should have at least 6-months validity from the time of entry into Kuwait and at least one blank page. What is the process upon arrival to Kuwait? Upon arrival, the Immigration Officers from Kuwait will verify that all the data on your e-Visa is valid and up to date. An immigration officer will then re-print / re-issue your e-Visa if needed. Please keep this document safe while you travel in Kuwait. Qual é o processo ao chegar no Kuwait? Ao chegar, os oficiais de imigração do Kuwait irão verificar que todos os dados no seu e-Visa são válidos e estão atualizados. Um oficial de imigração irá, então, fazer uma nova impressão/emissão do e-Visa, caso necessário. Por favor, mantenha esse documento em segurança durante sua viagem pelo Kuwait. How long can I stay in Kuwait with an e-Visa? The Kuwait e-Visa for Tourism allows for stays of a maximum of 30 days starting from the entry date. This visa is for tourism purposes only, working is not possible with this visa! What countries are eligible for a Kuwait e-Visa? When will I receive my e-Visa? You will receive your visa in approximately 3 business days by email if you pay for the Standard Processing, 2 business days if you pay for the Rush Processing and 12 hours for the Super Rush Processing. Print this document and take it with you on your trip. How many entries does a Kuwait e-Visa allow? The Kuwait e-Visa allows for a single entry. What is a GCC resident? GCC stands for Gulf Cooperation Council (GCC), which is a political and economic alliance of Middle Eastern countries: Saudi Arabia, Bahrain, Qatar, United Arab Emirates and Oman. GCC Resident simply means that you are a resident of one of these countries. I have residency in a GCC country. Can I still apply for this e-Visa online? You can ONLY apply online IF you have residency (exceeding 6 months when applying for e-Visa) from any of the following countries: Saudi Arabia, Bahrain, Qatar, United Arab Emirates and Oman. A copy of the Sponsor's GCC residency must also be sent with your e-Visa application, as well as for dependents such as a spouse, child, domestic labor etc who will be presented with you on arrival. Can I apply online if I do not have valid passport but a temporary travel document? No, unfortunately you can not apply online if you do not have a valid passport with at least 6 months validity. Contact the nearest Kuwait embassy for more info. What should I do if the data on the processed e-Visa does not match with that on my passport? Data inconsistency between the e-Visa and your passport will render the e-Visa invalid. You will need to re-apply, making sure that the information matches exactly. If you find errors in your application, please inform us ASAP.